In today's snow-driven avian invasion, a unique visitor arrived. 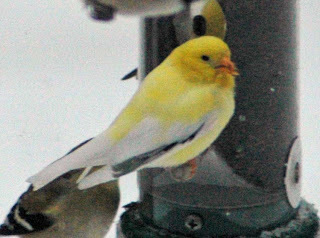 We believe him to be a leucistic goldfinch. Leucism is a variation of albinism in which there is reduction in all types of pigment, not just melanin. 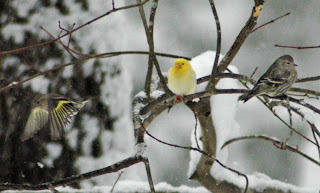 Here he is with couple of regular goldfinches in their normal winter colors. He certainly had us scouring our bird books. Thanks to our neighbor Juan Pons for helping with the identification. 04/07/2009 Update: The finch has become a regular around the feeder this spring and we are happy to have him around. He's a ray of sunshine any time he arrives. Henrys Lake Fanatic here. You have your own blog!